Working in an 18th century library at an estate comes with its privileges. Last week we presented the project ‘The library at Leufstabruk’ at the Nordiskt slotts- och herrgårdssymposium in Linköping. The congress combined one day of lectures with two days of excursions to six different mansions in Östergötland. Herrgård research may be a niche but that did not prevent some one hundred researchers, curators and country house enthusiasts to attend a three day congress at Östergötlands museum in Linköping. The key notes were by Professor Jon Stobart of Manchester Metropolitan University and Dr Mathieu da Vinha of Château de Versailles. Stobart spoke about physical and emotional well-being in 18th century country houses. He addressed topics like heating and furniture, with examples of local cultural preferences that defined ‘home comfort’. English travelers were often complaining about the intense heat in Swedish country houses. Indoor temperatures in Sweden could be six degrees higher than what was considered comfortable in England. Similar questions could of course by asked about library comfort. 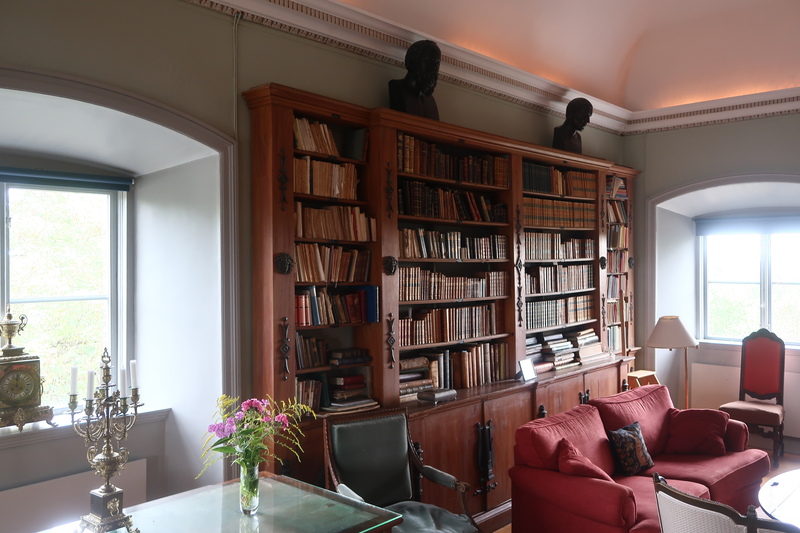 What makes a private library in a country house comfortable? What did people expect in terms of library architecture, display and the build up of their collections? And is that different in various corners of Europe? Peter Sjökvist and Helena Backman explaining digital access to Leufsta library. Our presentation about Leufsta library was part of a session named ‘Makt och minne, inflytande och kunskap’, that is, Power and Memory. Obviously this was another good opportunity to present and introduce the project and to explain the digital access that we are creating through Swedish (Libris, Alvin-ProBok) and Dutch (STCN, Delpher) platforms. Furthermore, we could put the project in a broader research context and show connections with a project like Mediate. After all, Leufsta library not only holds the household names of Enlightenment philosophy, but also hundreds of the probable literary bestsellers of the 18th century. More on this next year, when we present the project at the upcoming Mediate conference Private libraries and private library inventories, 1665 – 1830 in Nijmegen, January 2019. The material reflection of the congress were the excursions to six very different castles and mansions around Linköping on Friday and Saturday. This meant two days of discussions about herrgård culture, furniture, art, interior design, preservation and authenticity, combined with aristocratic display, historical dinners and tales from Swedish history. The six mansions that we visited very different in nature, ranging from a majestic privately owned castle like Sturefors to mansions on a more human scale such as Olivehult and the rustic Ljung. Some places are a museum today, such as Löfstad slott, and Nobel prize winner Verner von Heidenstam’s mansion Övralid. The final stop was at the privately owned Ulfåsa where we were guided by one of the current owners. The six mansions covered at least four centuries of herrgård culture, with very different interior styles, display of wealth and also levels of decay. There were books in all mansions, ranging from an everyday bookshelf to a grand Enlightenment library. 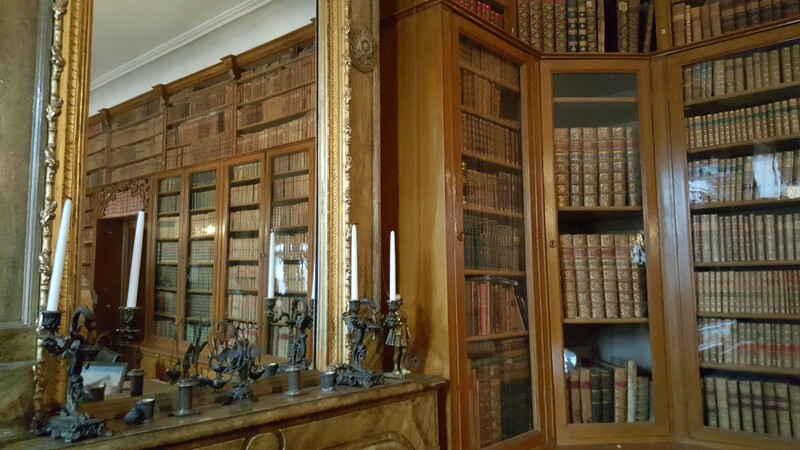 A museum like Löfstad has a library that appears to be frozen in time, the late 18th and early 19th century that is. You will find the works of Rousseau here, the Encyclopédie of Diderot and d’Alembert, Edward Gibbons Decline and fall, and other famous books from the time, ordered on the basis of size and the color of the spines. The library at Ulfåsa must have been quite similar to the one at Löfstad in the 19th century. Since that time, however, the collections have been dispersed and built up again multiple times. The result is library where you will find the works of Rousseau next to a copy of Anne Frank’s diary. The library of Olivehult is very original, housed at the attic and clearly not meant for display. Bookcases are randomly placed in the room, arguably in an attempt to cram as much books as possible in the attic. The collection holds a considerable number of smaller books and ephemera such as almanacs. Moreover, the collection is known to hold a great number of books on garden architecture. Somewhat different from all the other places is the library of Nobel Prize winner Verner von Heidenstam (1859-1940). His mansion Övralid is situated on the top of hill with a beautiful view over Lake Vättern. The oldest books date from the 18th century, such as Björnståhl’s travels. There are some classics from the field of natural history, such as Svenska fåglar. Among the modern editions, we find the Edda and the Koran, alongside a number of books that supposedly came from the library of August Strindberg. Arguably, Övralid is not the typical herrgård library in terms of contents, but the design resembles the style of a Victorian apartment. Herrgård libraries are generally inaccessible and not well documented. This is understandable, especially for those places that remain in private hands today. 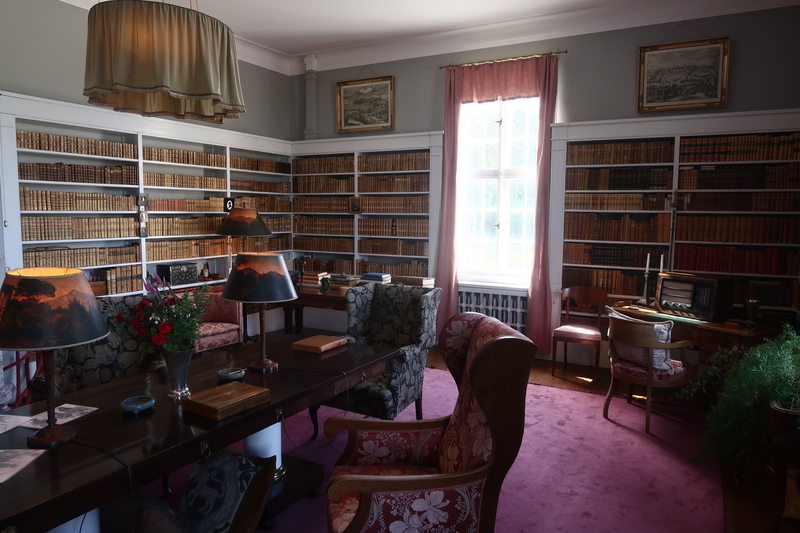 However, if there is one thing that we have learned from Leufsta, it is that the library is a key element in understanding everyday life at the herrgård. There are books on mining, engineering and economics that were needed to run the bruk, books on natural history to serve the baron’s work as an entomologist, Enlightenment philosophy for general development, and a range of novels that might have been read by many at the mansion. It is difficult to move beyond general remarks about country house libraries if you do not catalogue the books, make them available for research and provide structured data on provenances and other material evidence. There is a card catalogue at Löfstad and a typoscript catalogue at Olivehult, but both are not very useful from a scholarly perspective. Entries such as ‘Almanacs 1750-1820’ are not uncommon, as if there is no need to differentiate. We have no clue about the exact contents of herrgård libraries, let alone where these books came from, how and by whom they were read, and to what extant these practices were local, national or even international. It would be most desirable to come up with a centralized solution for all of Scandinavia, probably in similar fashion as the National Trust has done in Great-Britain. Sure, there are some practical questions that need to be resolved, but could we please do this in haste? Now matter how comfortable a library feels in terms of design, it is pretty useless from a book historian’s perspective if we don’t know what is on the shelves!